Sooner or later, any worthwhile superhero is going to find him or herself trapped in a tantalizing vision of the life they might have lived if they had never started fighting crime. The results are pretty much always tremendous. Alan Moore’s “For The Man Who Has Everything” is one of the best Superman stories ever told, and its adaptation is one of the best Justice League Unlimited episodes. Then there’s the Batman: The Animated Series classic “Perchance To Dream,” whose depiction of Bruce Wayne living in a Gotham City with some other man as Batman, engaged to Selina Kyle, and reunited with his parents offers quite a few direct parallels with the construction of tonight’s Arrow episode. The appeal of stories like this isn’t hard to work out, and it’s underlined in Oliver and Thea’s heartbreaking chat toward the end of “Invasion!” With precious few exceptions, superheroes are motivated by some profound loss, a personal tragedy that drives them to bring justice to others. Stories like tonight’s give Oliver and his friends a chance to reckon with everything that has shaped who they are, and to decide whether they can bear to keep fighting even if it means accepting all that pain once more. What’s brilliant about tonight’s episode is that it doesn’t simply present a fantasy existence for Oliver, or even an individual dream for each of our heroes, but rather a shared vision for all five of them. The focus is mostly on Oliver in the early going, and Sara is the only other captive who betrays any initial sense that something is wrong when she gives Laurel that extra hug. Thea, John, and Ray are so enmeshed in their perfect existence that one could be forgiven for forgetting they aren’t just constructs in Oliver’s dream. But that’s what makes the episode so fascinating. Diggle isn’t just the Green Arrow because somebody had to fill the role in Oliver’s absence, but because he needs to be a hero in his own right. Some of that, I suspect, is a matter of narrative convenience, but there’s an intriguing subtext here: Oliver’s path to becoming the Green Arrow was essentially accidental, something that could be undone by simply not having him get on board the Queen’s Gambit. Diggle, on the other hand, is fundamentally a soldier, and even allowing him a world where his brother is alive and incarcerated can’t entirely erase the trauma he carries. The episode abounds with perfect little touches. Thea gets a world where both her father and her mother are alive to watch her grow up, yet she also receives unambiguous affirmation from her biological father Malcolm. Ray is engaged to Felicity, even as he briefly realizes that she isn’t even the former lover he should be gladdest to be reunited with. Oliver earns kind words from Detective Lance, who isn’t an alcoholic in this world, without having to suffer through several years of hell first. Sara is more vocal about being LGBT than she ever really got to be when she and Laurel were alive at the same time (an amazing thing to have to qualify), with the passing implication that part of the reason she never had an affair with Oliver was because she didn’t have to conceal her primary attractions. Look, maybe that’s too big a leap, but tonight’s episode is the rare Arrow episode that feels like it can support such deeper, possibly tenuous analysis. The writing, the direction, and especially the acting—both by the five “real” people and all the others, who just want Oliver to go ahead with that damn wedding of his—all convey a world designed around the desires of its inhabitants, both big and small. Figuring out all the ways that that manifests is part of the story’s appeal. And, much as this is Oliver’s show, the others all get their moments. Sara proves she doesn’t even need her memories to be this universe’s fiercest warrior when she takes down Deathstroke like it’s nothing. Diggle keeps questioning even after demanding Oliver leave, and he’s the one who works out the Smoak Technologies building is what they need to focus on. Ray… well, he’s pretty clear the fifth most important person, which is fine given this is an Arrow episode instead of a Legends Of Tomorrow entry, but he at least gets to demonstrate his intelligence in helping the team navigate their escape. And Thea once again proves the emotional crux of the show. Someone had to be tempted by the perfect world in which they found themselves, and who better than the person who had already turned her back on crime-fighting, at least until the Dominators showed up? Thea’s argument is finely balanced, as it’s totally defensible even as it’s clearly incomplete. Thea doesn’t want to stay because she’s weak or because she’s selfish, but because she’s human, and she’s lost sight of why all the sacrifices she and everyone else has had to make were worth it. As she points out to Oliver, there’s nothing that feels unreal about her parents or Laurel, and the technical detail that they know these people are illusions is of vanishing importance. To leave this world isn’t just to accept all the pain of reality but to endure those losses all over again, and Thea can’t bring herself to. Oliver can because—and here we see the clearest indication that this really is the much improved season five incarnation of Oliver—he understands the nature and the purpose of his mission, and at a certain point all he sees in this fake world is evidence of the Dominators’ power and the need to keep fighting them and other threats. As he says, he never did any of this with expectation of a reward, so he doesn’t want this fake life. But he refuses to judge his sister for feeling differently, which makes it all the more powerful when she changes her mind and realizes there’s only one family member left to lose. “Invasion!” could have been an unholy mess, balancing the needs of a three-part (plus one scene of Supergirl) crossover with the Arrow-specific celebration of the 100-episode milestone. But the decision to focus on the show’s past and bring back old favorites like Moira, Deathstroke, Robert, and Moira—Moira is worth listing twice—ends up giving the show a way to develop the power and the threat of the Dominators without this crossover just being three straight episodes of heroes and aliens punching each other. Tonight’s episode also once again proves that Arrow doesn’t need to be gloomy or choked by petty interpersonal conflict to tell effective stories—it’s amazing I spent last night’s The Flash missing the warmth and emotional maturity of Arrow, but that’s where we’re at in 2016—as even the disagreements Oliver has with Diggle and Thea are well-motivated and resolved with minimal fuss. Like “For The Man Who Has Everything” and “Perchance To Dream” before it, this episode tells us everything we need to know about its heroes by temporarily removing what makes them who they are, and then just trusting their true selves to reemerge in due course. 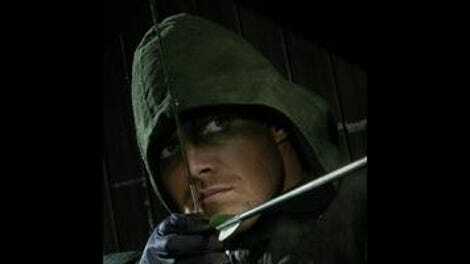 When Oliver looks back that last time at all those he has lost—not just those who have died, but the versions of people like Roy and Felicity who are now gone, perhaps never to return—we are left to recognize how much our hero has sacrificed along the way. That he so quickly turns and leaves to face his next battle is the enduring reminder that Oliver is indeed our hero. If this is how Arrow marks 100 episodes, then here’s to 100 more. If this isn’t the best episode in Arrow’s history, it’s damn close. My favorite running gag of the episode was how obsessed all the non-real characters were with Oliver getting married, with Felicity’s random reference in the Arrow Cave particularly good. Since Lyla appeared in The Flash part of the crossover but not tonight’s fantasy, I suppose it’s worth wondering what it means that Diggle’s fantasy life didn’t include his wife. My guess is it’s along the same lines as his role as Green Arrow: Diggle’s self-loathing is so total that even a perfect life for him has to involve some punishing loss. As for the rest of the episode, having Wild Dog deal with the superpowered Flash and Supergirl is a nice use of all three characters, even if it feels a touch underdeveloped compared with the genius of the main story. I’m pretty sure Curtis being this much of an annoying mess is intentional, and I’m happy to roll with it for the time being, but goodness is he not living up to the Mister Terrific moniker. Sooner or later, Arrow needs to address how much of a joke they have made him. I miss Laurel more than most, but it was dashed sporting of Katie Cassidy to get in some confused face acting one last time for the road as Oliver told Laurel he couldn’t stay. Never forget: Thea is Arrow’s true biggest badass. She ripped herself away from the fantasy world even after Oliver left her to it, faced down the illusion of her father, and figured out how to fly a damn alien spaceship. Makes you think the only reason she retired was to give everyone else a chance.